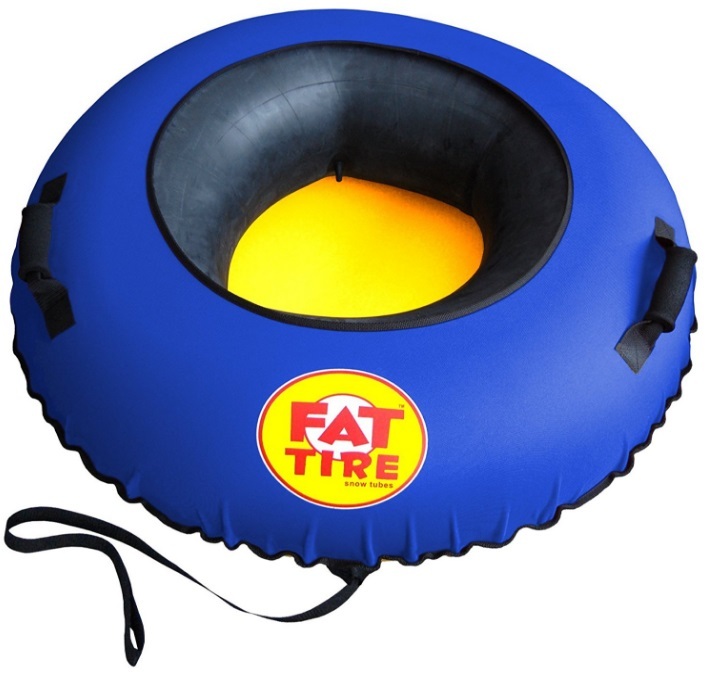 The features of the Fat Tire Snow Tube (costing you $100.00 on Amazon, even though it is possible that you can find some for cheaper) include a snow tube, made from quality material that is 39 inches in diameter and can hold up to 180 pounds on the exciting ride down on that hill. If you want to know more about the durability of the material that this particular tube is made from, be assured that the product uses an ultra-strong environmental protection PVC material, with a world-class seams technique, smooth weld, comfortable for riders and also includes a patch kit for any of those incidents that may come up. The high tolerance against cold temperatures is certainly a plus; with the Fat Tire Snow Tube you can expect a material that can stand temperatures up to minus 40 degrees (for those of you who may reside in the cold regions). Additional bonuses of the Fat Tire include two high negative pressure operating handles, a product safety edging process, in addition to a slick bottom surface designed for high-speed (for those who want experience). The final plus side of Fat Tire is the large valve for quick inflation and deflation, not to mention the double locking valve that guarantees an air tight seal. There have been some issues with the tube not staying as inflated as one would like; also, when it does get fully inflated, it can sometimes curl up into a “U” shape, obviously making it difficult to get some good traction down a hill. 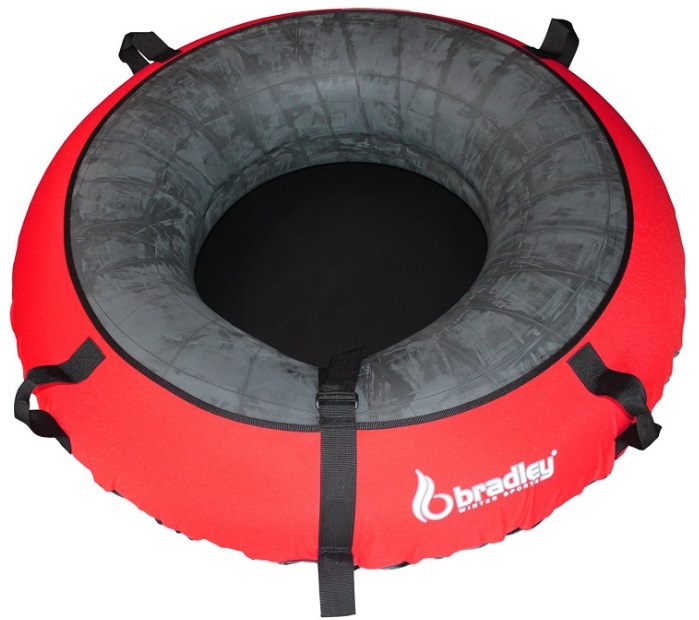 The Bradley heavy duty snow tube is only $100.00 and can come in a variety of festive colors; additional features include a thick high-quality inner tube with cover (all Bradley covers made in the USA). They measure approximately 57″ diameter (deflated) and 50″ across when inflated; the Bradley heavy duty tube cover is made up of 600D polyester canvas top, is mildew resistant, and has a durable, slick industrial vinyl bottom, with high performance in temperatures as low as -40 F, not to mention 425Lbs tensile strength. There is also patent pending sewn in tow loop, with additional straps to secure the tube and cover. The weight capacity of this particular tube is pretty impressive, being able to hold an individual as tall as 6’3 and 260 pounds; it is also incredibly durable with the manufacturer providing an excellent level of customer service if something does, in fact, go wrong with the tube. It can be a bit heavy and cumbersome to carry, which can be an inconvenience if you have to take it up and down a hill repeatedly; it may feel even heavier to the little ones so you might find yourself having to get that workout in and carry it for them. The Slippery Racer XL Snow Tube will run you a little over $100.00 on Amazon; it comes in a variety of colors and is considered to be an incredibly heavy duty commercial grade, inflatable snow tube. The durable, slick-coated hard shell polyethylene base absorbs impact impressively well and provides an ultra-smooth sliding surface. The Slippery Racer has double reinforced nylon webbed grip handles with an additional double reinforced pulley tow rope that has over 4300 lbs. of tensile strength, not to mention that is coated with exclusive ice vex cold-resistant treatment and can accommodate adults and kids (ages 4 and up). This snow tube is very durable and can endure the various sticks and branches that you may run across on those hills; it is also very easy to carry around with very little trouble at all. To inflate this particular tube you will probably have to use a compressor so if you do not have one, obviously that will be an additional purchase. There is also a really pungent rubber smell that seems to come off the tube so this may be a bit much to deal with if you have the tube in the car for an extended period of time. 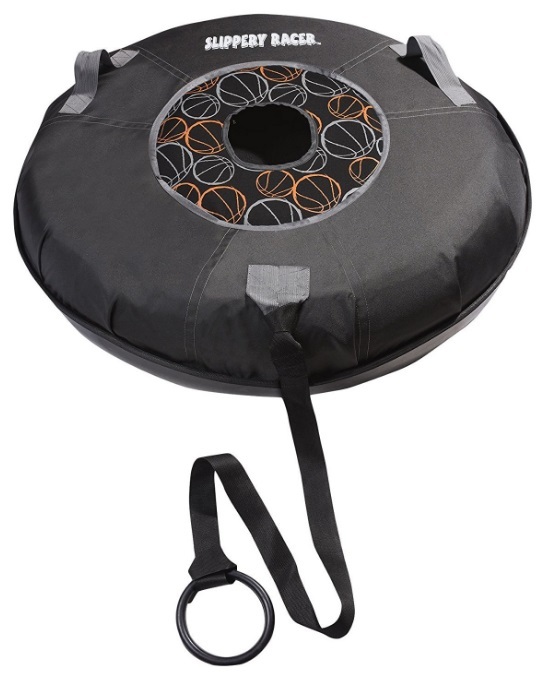 Ok I know, I know- this isn’t a snow tube per se, but it is definitely an item that should be on the review list. The Mad River Rocket is an award winning sled that has been ranked as one of the top 5 snow sled by the Wall Street Journal and has also been featured in The New York Times, ABC News, Fox, Ski Magazine, Popular Science, Yankee Magazine, and others! The Mad Rocket has a unique patented design that allows for full control and maneuverability and free-sledding tricks. The deep channels and grooves on the base of the sled maintain superior handling on snow; these particular intertube sleds are incredibly steerable and are perfect for family fun, cruising through the woods, exploring the backcountry, and snow tubes for sledding in deep snow! 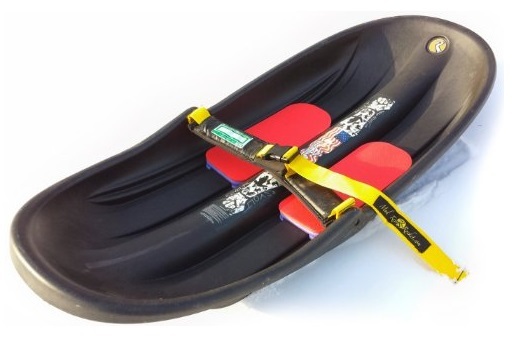 The material that the sled is made from is very resilient and made in the USA from automotive grade plastic and recycled materials for enhanced durability, making it also the perfect accessory for winter fun! The sleek design of the Mad River makes for a fun and thrilling ride down any hill; it handles perfectly and is ideal for those who stay in the backcountry. The foam pads for the knees could be a bit thicker to offer more support, especially for those who are a bit heavier. Also, the price (about $160.00) could be a little steep for some. 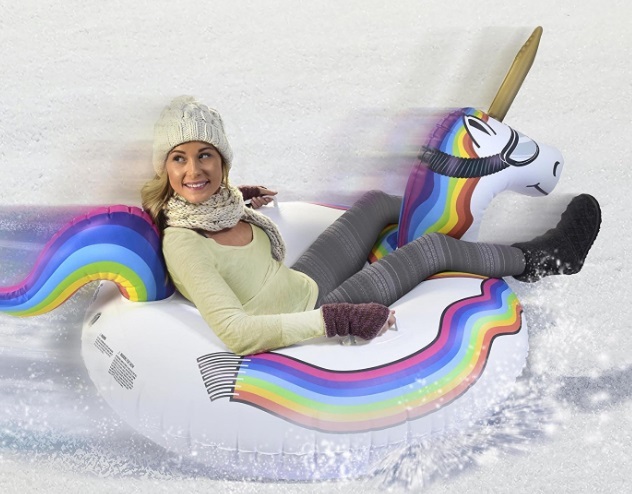 The GoFloats Unicorn snow tube is the perfect choice for the little ones out there and is perfect for sledding down those snowy hills in style! The material is 100% thicker than the competition to make for awesome designs that are both fun and functional, while also being reasonable priced (only costing $30.00 on Amazon). There is also a rapid-inflate valve that comes with this tube, inflating it within a matter of seconds so you are ready to enjoy that winter fun in no time. The price of this tube is certainly a plus; the tube is also made of incredibly sturdy plastic, ensuring that it can be of use for a number of years, if used properly and with care. There can be some issues with slow leaks that may require you to have to continually refill the tube over and over again, which can be naturally frustrating and inconvenient. Can you fill the tubes up with an electronic air machine? Yes, you can, it just may be difficult to get it past the ¾ full mark (it may not get 100% full). What is the best method to fill the tube? Can it double as a river floating tube? All in all, even though it’s not an actual tube, the Mad River Rocket is what appealed the most to me, especially because you won’t have to worry about dealing with an air pump or compressor. If you do want to go for a snow tube, I definitely recommend the GoFloats for the kids in your life and the Fat Tire tube for the adults. Just be mindful on what it will take to inflate the tube so you can make sure that you have everything you need.